Upgraded to ACI 318-11, spColumn is widely used for design of shear walls, bridge piers as well as typical framing elements in buildings and structures. Formerly pcaColumn, PCACOL, and IrrCOL, spColumn investigates sections that are impossible to find on design charts or to do by hand. spColumn is developed for the design and investigation of reinforced concrete sections subject to combined axial and flexural loads. The section can be rectangular, round or irregular, with any reinforcement layout or pattern. Slenderness effects can be simplified through moment magnification in lieu of complicated and time consuming 3D models to account for second order effects. The program offers investigation of irregularly shaped, reinforced concrete column sections that may contain openings or boundary elements. 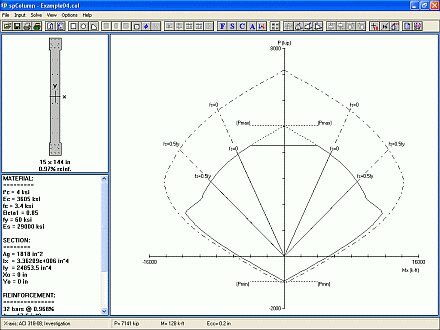 You can obtain the P-M interaction diagrams from both uniaxial and biaxial runs, as well as the Mx-My moment contour plots from biaxial runs for even the most irregular column and shear wall sections. Slenderness effects producing magnified moments may be included in the investigation. Top selling worldwide, spColumn supports ACI 318-11 and CSA A23.3-04 reinforced concrete design standards. This version implements ACI 318-11 and continues to refine implementation of slender column design provisions. Import/export of DXF files, nominal interaction diagrams, and display of capacities at your load point are just a few of the modification offered in the current version. 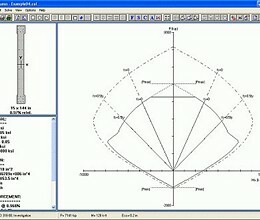 * spColumn download link provides trial version of the software. spColumn has been rated 5.0 out of 5 points. A total of 2 votes cast and 0 users reviewed the software.